Thanks to a special impeller designs ( X type Free-Vortex Impeller, S Type Single Vane Impeller and D Type Double Vane Impeller) this series is used different fields and different kinds of waste can be pump depending on the impeller structure. 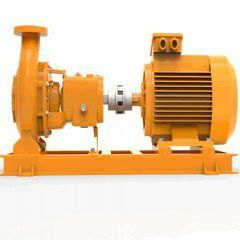 This series can be coupled with diesel engine and high-efficiency IE2 or IE3 (Optional) class electric motor. Thanks to back pull out design, the rotating parts of the pump are provided to change for maintenance and repair without removing suction and discharge line. An extended service life is achieved by generously dimensioned shafts and bearings. Various assembly option are possible- mono block, coupling, belt driven and vertical assembly. Different accesory options are avaible to extend mobility and protection of the pump- Stationery Cabinet System, mobile Cabinet System and trailer assembly options. Optimized oil chamber for lubrication and cooling of the mechanical seals. Thanks to special stuffing box design spiral grooves in the big helical seal chamber avoid contamination of the sealing environment with solids. Bearings can be lubricated either by oil or grease depending on the operating conditions of the pump and environment. Double and cartridge mechanical seal syetem design located in an oil bath for optimal operational security. Used SiC material for all types.